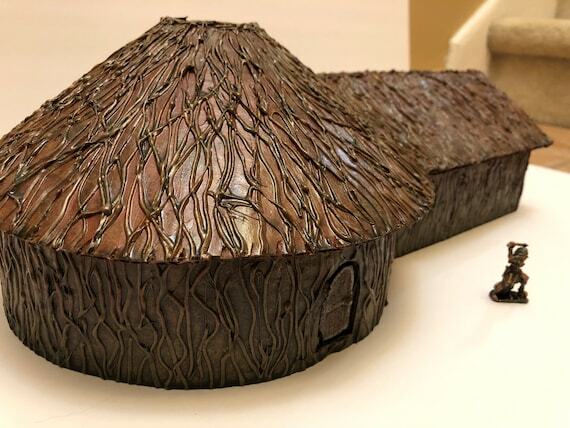 I created a Miniature Hut/Hovel for a game I ran a few years back. I’ve decided to sell it on Etsy for $25. Here are some photos and more details are below. BTW – email me (AnomieCoalition@hotmail.com) if you’d like to commission any custom builds! 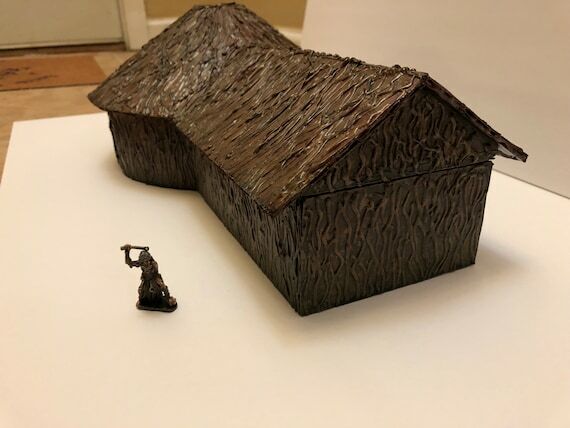 This is a custom built miniature Hut/Hovel for tabletop RPGs. Door opens/closes. Removable roof. 5’=1″ grid inside. Smoke hole in roof (you could put a tea light inside for a great gaming effect). 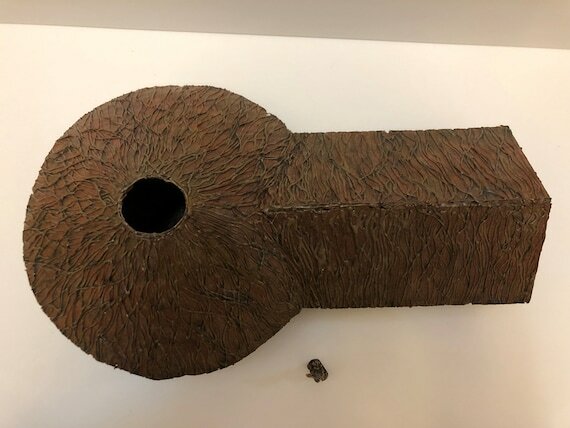 Constructed with cardboard and posterboard – sealed with Mod Podge and then varinsh for durability. I’ve just created a new map pack and it is available for only $2 at Drivethrurpg.com! We all need a magic shop for our adventures from time to time. This encounter map saves you the trouble of creating one on your own – and can easily serve as stand in for various other types of stores (Books, Curios, Oddities, or maybe just a simple trading post). This simple building has a storefront, backroom, and bedroom for the owner. The maps are provided in .JPG file format to either take to your local print shop or upload to your favorite VTT. Each map is also provided in this PDF for at home printing. Each page is overlapping &frac;12; inch with successive pages to the right and below the previous page. Print each page as Letter sized in portrait orientation with no adjustments made to scale. After they are printed simply cut away the white border and glue/tape pages together so that the overlapping parts match up for a seamless map. I’ve just published the 5th adventure in my Mistwick Marshes Campaign Setting. Its on sale right now at Drive Thru Rpg for only $3! The adventure begins as the party stumbles upon a Shambling Mound feasting upon impaled corpses. Regardless of how they resolve the encounter, they will be exposed to a strange fog that ultimately transforms its victims into Boggards dedicated to the service of the witch Anasinthe. The fog is spreading and now threatens the nearby settlement of Rania. Can the party solve the mystery and end this curse before it consumes them and all of Mistwick? This adventure is the fifth in a new campaign world (Mistwick Marshes) where the spirits of an ancient elvish civilization still roam the muggy swamp and don’t take kindly to those who seek to loot their ruins. Settlers on the frontier face constant perils from dangerous monsters, insidious witches, and roaming barbarian gangs. Complete Stat Blocks for all creatures and GM Reference Maps as close to the description of the encounter as possible. This includes a new Disease (“Boggard’s Fog”), several unique magical items, and Anasinthe (the Witch) that can be used in other adventures. Ready to Print, scaled (5′ = 1″) letter sized, multiple page PDFs in color for all combat encounters. No need to mess with printer settings – just print, cut the white margins, and glue/tape together so that the overlapping parts match for a seamless map. Full sized JPGs for all maps to use with your favorite VTT or to take to your local print shop. If you like it, please let me know in the comments! Categories: Uncategorized | Tags: 3.5, Adventure, Battlemap, Boggard, CC3, D&D, Disease, dnd, Dungeon, Encounter, Hovel, Map, Marsh, Pathfinder, Photoshop, RPG, Shambling Mound, Swamp, village, wilderness, Witch | Permalink. I’ve just published the 4th adventure in my Mistwick Marshes Campaign Setting. Its on sale right now at Drive Thru Rpg for only $3! The party is propositioned to clear the road to a new settlement site at Lake Rania. They are also separately tasked with seeking out an oracle rumored to still be alive in the ruins of an ancient elvish temple nearby. Their patron hopes to learn the identity of the mastermind behind a rash of crimes against racial minorities in the town. Unfortunately, the temple has partially sunk into the lake (rendering the entire first floor under water) and the oracle has been transformed into a hideous Medusa. Should the party escape this underwater tomb, they must still face its ghostly guardians who wish to keep its secrets buried. Finally, upon their return to the town, they will be ambushed by a cult of human supremacist who wish to use their death as a justification for a war against racial minorities in the region. Although this adventure was designed such that it could be placed into virtually any campaign world with minimal modifications, it also serves as the follow-up to DNMM-03 “Don’t Blame the Mob” and will lead into future adventures in Mistwick. The politics of the town and many of its inhabitants will become important NPCs and adventure hooks in the future. This adventure is the fourth in a new campaign world (Mistwick Marshes) where the spirits of an ancient elvish civilization still roam the muggy swamp and don’t take kindly to those who seek to loot their ruins. Settlers on the frontier face constant perils from dangerous monsters, insidious witches, and roaming barbarian gangs. This includes the main Temple map (2 floors) and 2 encounter maps (both available with or without the grid. Categories: Uncategorized | Tags: Adventure, Ambush, CC3, D&D, Elf, Ghost, Map, Medusa, oracle, Pathfinder, Photoshop, RPG, Temple | Permalink. Hey all – I’ve just published a new adventure on DriveThruRpg for only $2! The daughter of a prominent resident has been kidnapped and the Jademi (clan of nomadic half-elves) are suspected. An angry mob exacts revenge against non-humans and their sympathizers. While providing security for the ransom payment, the party is ambushed and discovers that the Jademi have been framed by the Fallen Sons (human supremacists who seek to incite a racial civil war). 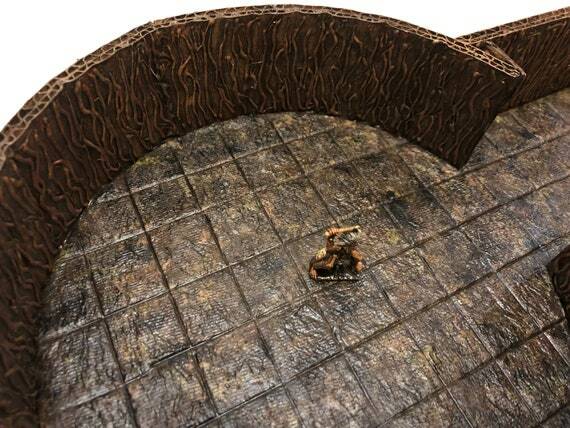 The party must infilitrate their camp in an ancient tomb to gather evidence of their guilt and end the riots. Although this adventure was designed such that it could be placed into virtually any campaign world with minimal modifications, it also serves as the follow-up to DNMM-02 “What Killed the Stiner Boy” and will lead into future adventures in Mistwick. The politics of the town and many of its inhabitants will become important NPCs and adventure hooks in the future. This adventure is the third in a new campaign world (Mistwick Marshes) where the spirits of an ancient elvish civilization still roam the muggy swamp and don’t take kindly to those who seek to loot their ruins. Settlers on the frontier face constant perils from dangerous monsters, insidious witches, and roaming barbarian gangs. This includes a regional map of the Mistwick Marshes and a village map for Estermere. Full sized JPGs for all encounters to use with your favorite VTT or to take to your local print shop. Categories: Uncategorized | Tags: Adventure, Bandits, CC3, D&D, Kidnap, Map, Marsh, Mob, Pathfinder, Photoshop, Riot, RPG, Swamp | Permalink. Hey all – I’ve just released a new map pack bundle of randomly generated, bare bones dungeons to DrivethruRPG for only $2. They can literally be thrown into any campaign or scenario. 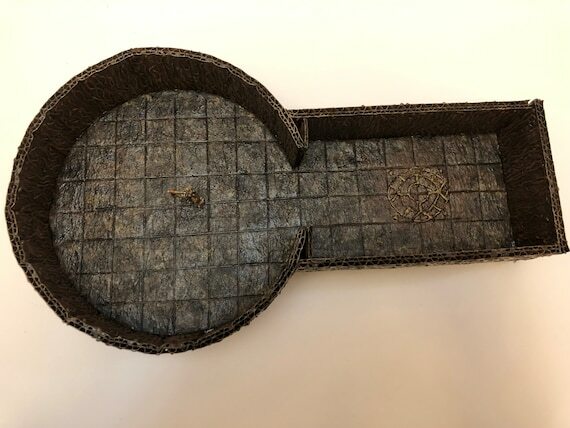 Use it to plan your next adventure or just keep it handy in case your players unexpectedly wander into a subterranean environment. Each map has 5-7 distinct areas to explore with secret passages and rooms. Categories: Uncategorized | Tags: catacomb, D&D, dnd, Dungeon, Map, mine, Pathfinder, Photoshop, random, RPG, tomb | Permalink. Hey all – Just finished a new map pack for “The Cold Horns Inn”. It is a massive inn with three floors and 44 rooms/areas. The main floor hosts a stable, guestrooms, drinking halls, garden, and other amenities. The second floor is primarily a hay loft and guard tower. The basement features a stage, drinking halls, private suites, servants quarters, and plenty of space for storage through the long winter. 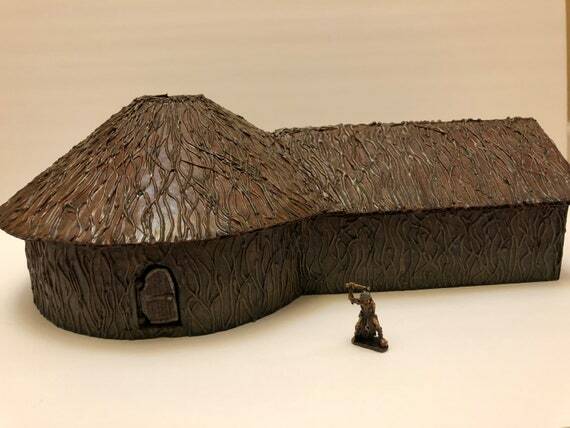 It is loosely based on the “Calling Horns Inn” from Forgotten Realms – and the inspiration/sketches were provided by Casey77 at the Cartographer’s Guild. The map is drawn to scale (5’=1″) and is ready to print from the comfort of your own home or upload to your favorite VTT. All maps are provide with or without the grid. Each map is also provided in this PDF for at home printing. There will be a GM map with labels followed by successive pages of scaled images of that map. Each page is overlapping &frac;12; inch with successive pages to the right and below the previous page. Print each page as Letter sized with no adjustments made to scale. After they are printed simply cut away the white border and glue/tape pages together so that the overlapping parts match up for a seamless map. This Map Pack DOES NOT contain adventure notes or stat blocks, but it does contain very bare-bones room descriptions on the instructions page. Categories: Uncategorized | Tags: Adventure, Bar, brothel, Calling Horns, D&D, dnd, Dungeon, Encounter, Forgotten Realms, fort, inn, Map, Pathfinder, Photoshop, RPG, Stage, Suite | Permalink. for Full Adventures and Map Packs.